Planets form out of a disk of material swirling around a young star. 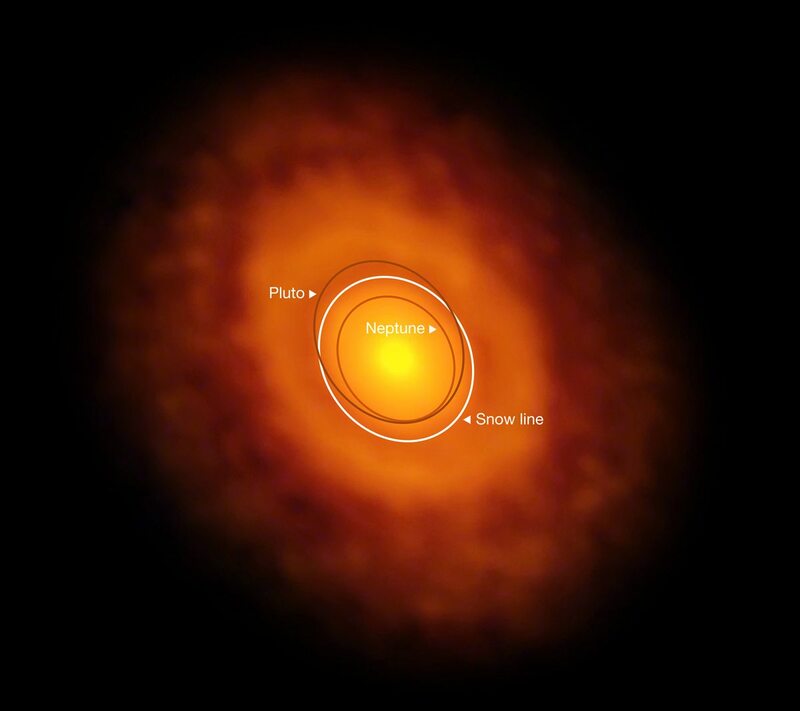 As clumps form in this protoplanetary disk, they collide an merge to become the planets we see today. 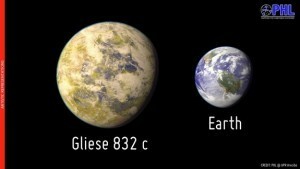 The composition of those planets depends upon where they formed. Those forming closer to the star tend to be dry and rocky, while those forming farther from the star tend to be rich with water. This is because the heat of the star tends to drive away volatiles like water, producing what is known as a frost line or ice line. Beyond this distance it’s cold enough for ice to exist. Closer than the ice line and it’s too warm. At least that’s the idea. Actually observing the ice line of a young planetary system is a challenge. For a Sun-like star, the ice line is about three astronomical units from the star. That’s about the middle of the asteroid belt for our solar system. Imaging that line in a young system hundreds of light years away is difficult. But recently the star V883 Orionis has pushed its ice line much farther away. It’s only a bit more massive than our Sun, but as material from its protoplanetary disk has been consumed by the star it’s gotten much hotter. It’s currently about 400 times more luminous than our Sun. As a result, it’s ice line has been pushed back more than 40 astronomical units, which would put it beyond the orbit of Neptune in our solar system. This is far enough out that the Atacama Large Millimeter/submillimeter Array (ALMA) is able to see the ice line directly. Not only does this validate the existence of ice lines in a planetary system, it also demonstrates how the ice line can shift significantly during the formation period of a solar system. Over time V883 Orionis will dim to a luminosity similar to the Sun’s, and it’s ice line will shrink accordingly. It’s an excellent example of the complexity of planetary formation. 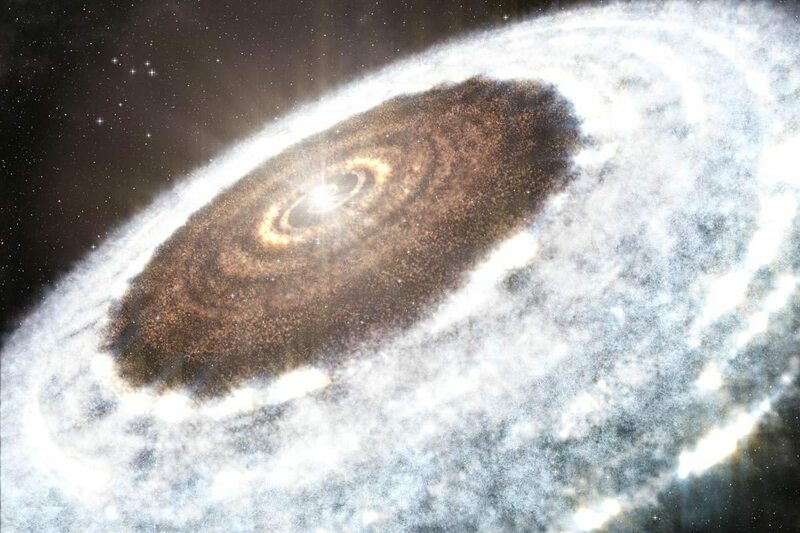 In a protoplanetary disk which has (relatively) more C than O, I guess there would be a rather different ‘ice’ (or ‘snow’) line … that where methane or ammonia (or some more complex molecule?) ‘freezes’ out (though there’d still be some water/ice/snow, I guess). Just for clarity, I suppose I should point out that by “ice” in my previous reply, I was specifically using the example of H2O ice. The distances and temperatures I’ve used there will not hold true for different types of ice. For example, CO ice sublimates at ~30 K. Therefore CO ice will not form where temperatures exceed that value, which will be a lot further out than 3-4 AU. Something else occurred to me while I thought about this; there were the grains of refractory material collected by the Stardust mission at comet Wild 2. If this process we are observing at V883 also occurred in our own star’s past, I wonder if that may account for these refractory grains? Just a thought.